Do you feel like you have to shave every day? Are you tired of the nicks and irritation shaving leaves behind? Not only does it leave ingrown hairs, the cost of shaving can also add up over the years. 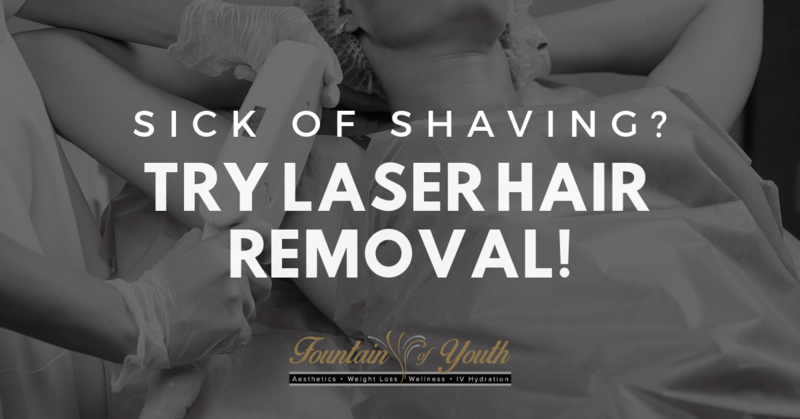 If you are sick of shaving, then maybe it’s time for you to try laser hair removal. This safe and quick method not only smooths your arms and legs, it can also help eliminate the need to shave altogether! The process we use at Fountain of Youth is safe and effective in removing unwanted body hair. We use a device that beams highly concentrated light into the follicles of the hair. The pigment absorbs the light and destroys the hair, eliminating regrowth. Through this treatment, we are able to specifically target the dark, coarse hair follicles you want to be removed. Imagine the time and money you will save by switching to laser hair removal. Due to the long term results, you will no longer have to buy those expensive razors or shave creams. Scheduling those costly wax sessions will also be a thing of the past. Shaving tends to be time-consuming. Why spend most of your morning in the shower shaving, when you could be at the pool? After a few sessions of laser hair removal, you will be on your way to smoother skin for the summer. How many times have you nicked yourself while shaving? Razor burn and irritation alone are enough to make you skip the beach and stay inside. Laser hair removal has minimal side effects with most describing the feeling as a rapid “snap” feeling against the skin. Your skin will see less irritation and fewer of those unsightly ingrown hairs. Laser hair removal also precisely targets the hair you want to be removed without damaging the surrounding area. Better precision means you could see faster results. The treatments are so quick that you will be on your way to smoother skin in under 30 minutes. Since the pulse from the laser takes just a fraction of a second, more hair can be treated at one time. Depending on the sizes of the area, sessions could last a little longer. One of the more bothersome aspects of waxing or shaving is waiting for your hair to regrow before your next session. It can almost seem like a never-ending process, right? Since laser hair removal targets the follicle, there is no need for regrowth or prep before your next treatment. Give your razor a rest! Reduce the appearance of unsightly hair on your arms, legs and bikini area by trying laser hair removal. Schedule a session today at Fountain of Youth for a smoother appearance! Fountain of Youth is your home for precise laser hair removal. Visit us at 6729 Spanish Fort Blvd. Ste BC in Spanish Fort, Alabama, call us at (251) 525-8446.